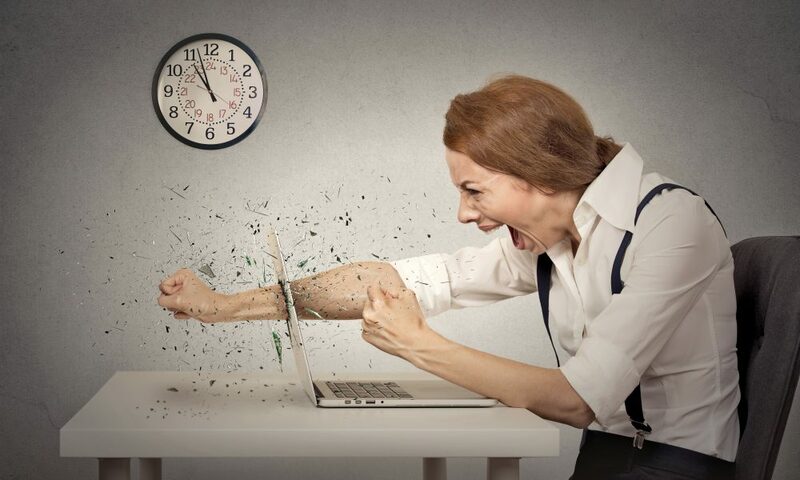 When it takes 10-15 minutes to figure out how to project on a screen or connect to a skype meeting, and you only have 15 minutes left to talk, it’s just annoying. Sometimes it’s just easier to reschedule. Or schedule for an hour. Everyone’s checking their cell phones during meetings. You. Are. Not. Paying. Attention. Don’t make me slap it out of your hand. On that note – let’s talk about answering calls during meetings. I don’t care if it’s only going to take a minute. Unless the pope is calling, send it to voicemail. Having access to emails on my phone – 24/7. It starts with technology / companies giving us the access which implies you need to be tied in constantly. Well, bad habits creates employee burnout. Maybe that’s why New York is trying to make “it illegal for employees to access their work email after work hours.” Check it out HERE. Skype messenger. Not only can you monitor and track all of my emails and browsers searches, you can now monitor every second of every day. And make sure someone can personally message me to interrupt what I’m doing (No, this presentation for the CFO isn’t important. Let me answer your question first). Nothing says trust more than tracking my every move. Especially when you send me a weekly summary of how I’ve spent my time. Having five systems to put the same information into. And then having five to pull the data out of and none of it matches. Reconciling thousands of data lines in excel isn’t fun. Even if you’re drinking tequila. How about the spam filters that don’t filter spam. But instead filter out emails from someone I’ve been talking with. For the past two years. If they don’t work – please don’t enable them IT, please? Constant notifications. I’ve got a call in 15 minutes, a new email just came in and there’s a voicemail I haven’t answered. If you didn’t have anxiety before you had the job, you’ve got it now. Good luck trying to figure out which ones are truly important and which are just noise. You dial into a call, after I booked a room and suppliers have flown in to meet you. I get it, there’s a Bigfoot lurking in the 50 feet between our two buildings. I know I’m old fashioned, but try to show up in person when it’s only a 2 minute walk. Constant technology issues. We just paid hundreds of thousands to integrate your system with ours. And now I don’t have the right access. Or the system keeps crashing. Technology is great when it’s working, but if you’re spending more time trying to fix it versus using it, is it really worth it?